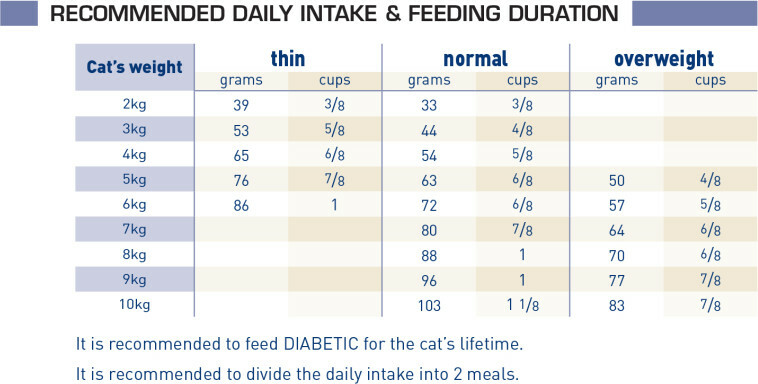 Diabetic For cats with diabetes mellitus. Dehydrated poultry protein, barley, wheat gluten*, maize gluten, tapioca, soya protein isolate*, animal fats, hydrolysed animal proteins, vegetable fibres, chicory pulp, fish oil, psyllium husks and seeds, minerals, Fructo-Oligo-Saccharides (FOS), soya oil, marigold extract (source of lutein). Crude ash: 6.2%. Crude fibre: 3.6%. Crude oil fats: 12%. Moisture: 5.5%. Protein: 46%.